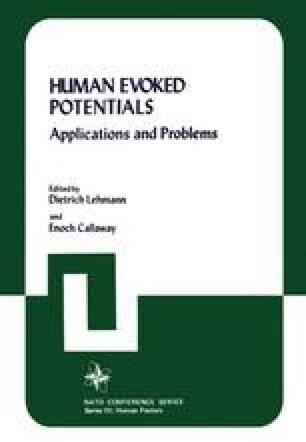 Since the early days of averaging evoked potentials (EPs) in man, the importance of cognitive variables, as well as stimulus variables, has been recognized (e.g., Chapman and Bragdon, 1964). Using an experimental design which involves processing number and letter stimuli, we have been studying EP effects related to a variety of cognitive operations (Chapman, 1965, 1966, 1969a, 1969b, 1973, 1974a, 1974b, 1977, in press; Chapman et al., in press (a); Chapman et al. in press (b). Most of our analyses have been for the CPZ scalp location (recorded monopolar on the midline one-third of the distance from Cz to Pz; reference was linked ear- lobes). It is of interest to study the cognitive effects at other sites, with a particular focus on the question of hemispheric differences and parietal-occipital differences.